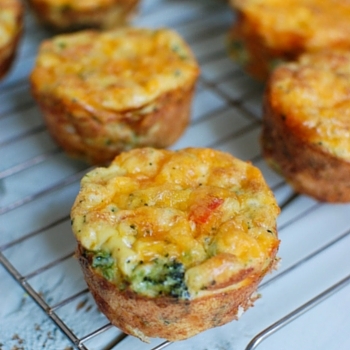 Broccoli Cheddar Cups are the perfect kid-friendly breakfast, lunch or snack. Oh, and adults love them too! They are great to have on-hand when running late for work because they can easily be taken on-the-go. These are also great for kids because they can be warmed up in less than one minute for an easy breakfast as the kids run out the door, or packed in a lunchbox and taken to school. I know for me, when I was growing up, quick, easy and healthy meals were really important throughout the school year, especially when I started to get very involved in sports. It is especially important to make sure that we are getting some protein and calcium as a part of our daily diet to keep us energized and fueled throughout the day. These Broccoli Cheddar Cups mix together eggs, giving you that boost of protein, along with cheddar cheese for calcium and extra protein and, of course, sneak in some vitamin-rich vegetables. And, who doesn’t love broccoli and cheese together? Top with some delicious Arps Dairy Sour Cream and you have yourself one easy, delicious on-the-go breakfast or snack the whole family will enjoy! Not only are these great for the kids and school lunch boxes, but they are nice to have in your freezer for when company comes to town. You can freeze half for later by wrapping them individually in plastic wrap and then putting them in a large Ziploc bag for later. Once you are ready to eat an egg muffin, remove it from the freezer and microwave it for 1-2 minutes. It really is that easy! Preheat the oven to 375 degrees. Grease muffin tins (enough for 14-16 large muffins), and set aside. Steam or cook the broccoli florets until tender. Remove from heat and set aside. In a large bowl crack the eggs and add the egg whites and whisk them together. Set aside. In a large skillet, heat 2 tablespoons olive oil over medium high heat. Add the onion and bell pepper and sauté for 6-7 minutes, until the onion is soft. Add the cooked vegetables and broccoli to the eggs along with 1 cup of the cheddar cheese. Mix to combine. Add the nutmeg, salt and pepper and gently stir to combine everything together. Pour the egg mixture into the greased muffin tins (about 3/4 of the way full) and sprinkle each muffin with a small amount of the 1/2 cup of cheddar cheese. Put the egg muffins in the oven and bake for 20-25 minutes until the egg muffins are set in the middle and begin to turn golden brown on the edges. Remove from the oven and let cool for a 1/2 hour before removing from the muffin tin. Apply a dollop of Arps Dairy’s Sour Cream to each Broccoli Cheddar Cup for added flavor! 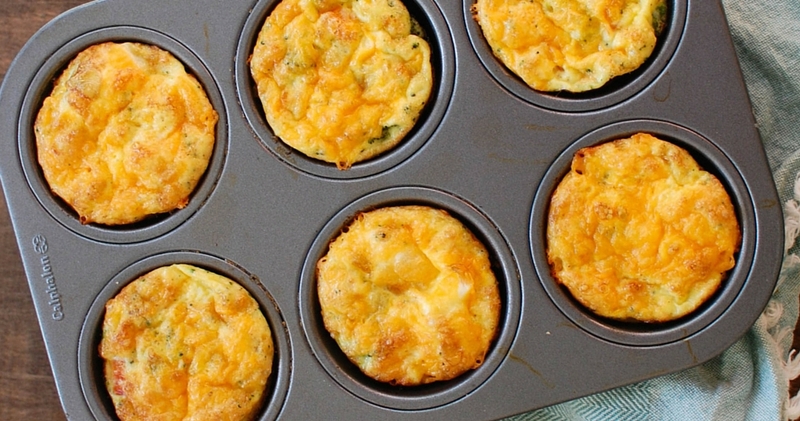 Refrigerate the egg muffins in an airtight container for up to one week. Notes: If you want to freeze these, wrap them in plastic wrap individually and then put them in a large Ziploc bag. Remove from the freezer when you are ready to eat them, and heat them in the microwave for two minutes or until warm.